Diamonds Chicago is a Wholesale Diamond Dealer and Diamond Broker. Diamonds Chicago is a Wholesale Diamond Supplier to the Jewelry Stores in Chicago Illinois. 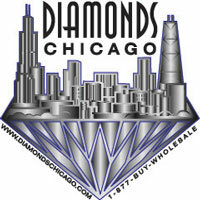 Now you can buy Certified Loose Diamonds Directly from the Wholesale Diamond Dealer in Chicago. Diamonds Chicago has Over 40,000 Loose Diamonds to Choose from. Most of our Certified Loose Diamonds are GIA or EGL Certified. Diamonds Chicago also has over 3,000 Diamond Engagement Rings and Engagement Semi Mount Settings to choose from once you have selected your perfect diamond. To search through The Diamonds Chicago Certified Loose Diamond Database just enter the specifications you would like in your loose diamond and search through the loose diamonds selection. Then just call 1-312-422-0400 to schedule your appointment to come in to Diamonds Chicago to view your Certified Loose Diamond. We will not be undersold! If you find a Similar diamond cheaper anywhere just call us and we will beat the price.